Ever since we subscribed to our CSA (more on that later) I have found myself becoming more and more adventurous with food. And while I find it fun and adventurous to try new recipes and foods, I also don’t like being the first to try them. Charlie and I attended an Indian Wedding Weekend in Chicago a year-and-a-half ago, and he was assigned with walking in front of me at the buffet line and trying everything to let me know if I would like it. I know that might be epicuriously lazy. But I ‘m just kind of scared of diving head first into a bucket of food I don’t recognize. Digressions aside, occasionally I do whip up something adventurous in the kitchen that even though I know I won’t like it, I’m confident Charlie will find it be a somewhat “party in his mouth.” Such was the case this past weekend. We’re big into using all of our food. I hate throwing food out, because it is sad, and also a waste of money. 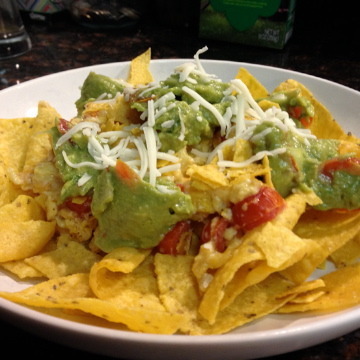 The night before we had some fresh tortilla chips from Albertson’s (the BEST tortilla chips! 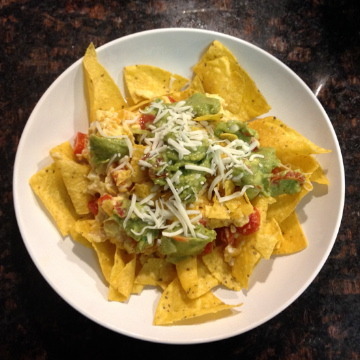 ), homemade Guac made with our CSA avocados, chicken, and salads. Well the morning after, when I looked in the fridge I saw that we had about a half serving of Guac left… Maybe it is being in so close proximity to Mexico, but Mexican food is slowly growing on me. I decided to delve into my inner Mexican foodie and whip up the below for Charlie. The reviews were stellar.